Monkeys in Space will be returning to the San Diego stage after a two-year hiatus to grow… and record our new album Kill Your Past. Join us and SD locals Van Goat- Friday, March 17th at 710 Beach Club in Pacific Beach, Ca to celebrate St. Patty’s day like only the Monkeys can! Tons of giveaways, green beer and a trip to space.. lets do this. Hey kiddos, Here is a link to some footage I found on an old flip cam- Its got a pre pre-production sessions and some Flying Under the Influence tracking on it.. I figured it was now or never to show it as we are finishing up the tracking on our second real release. I think we finally settled on a name for our upcoming album. “People-Pleasing” takes the cake and is also the title track on the album. Interestingly enough, or not so much, the album name stems from another one of those “fed up with the world” conversations J and I have been having all too frequently lately. “No more People Pleasing” View Pre-Production on People Pleasing and some older tracks here.. Really jonesin for some new MI$.. take a listen to this one for another sneak-peak.. video content is kinda whack, sorry guys- life in the fastlane is cutting into my editing (and blogging) time.. Oh Yea and this one shot at 4:10am on the eve of our move into the new pad! 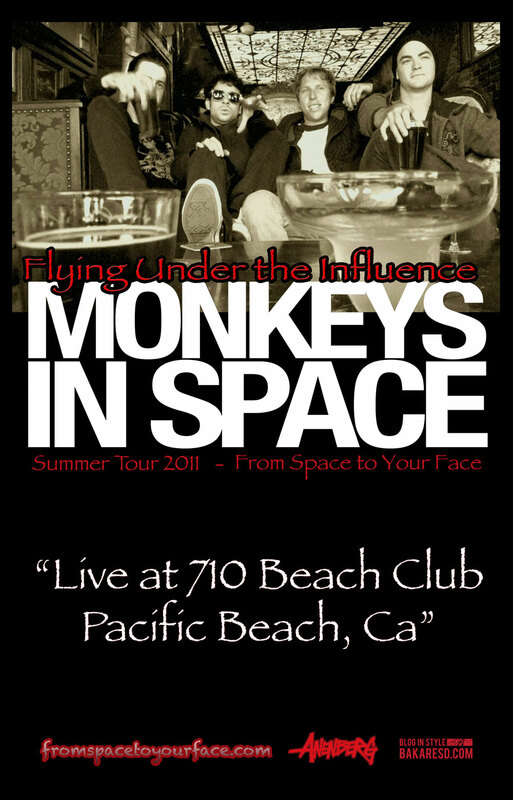 Hope to see all of our favorite local Monkeys to 710 Beach Club in Pacific Beach on August 19th! We will be debuting a few new jams and have some giveaways planned- its gonna be a kick in the face of a time. Check out our 91x Radio Promo for our show tonight.. Thanks radio land. Follow the link below and click the player in the center of the page.